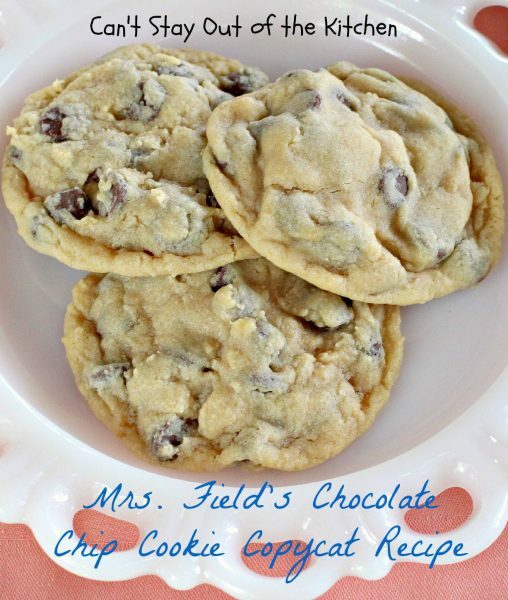 Mrs. Field’s Chocolate Chip Cookie Copycat Recipe is one of the most spectacular copycat recipes ever! 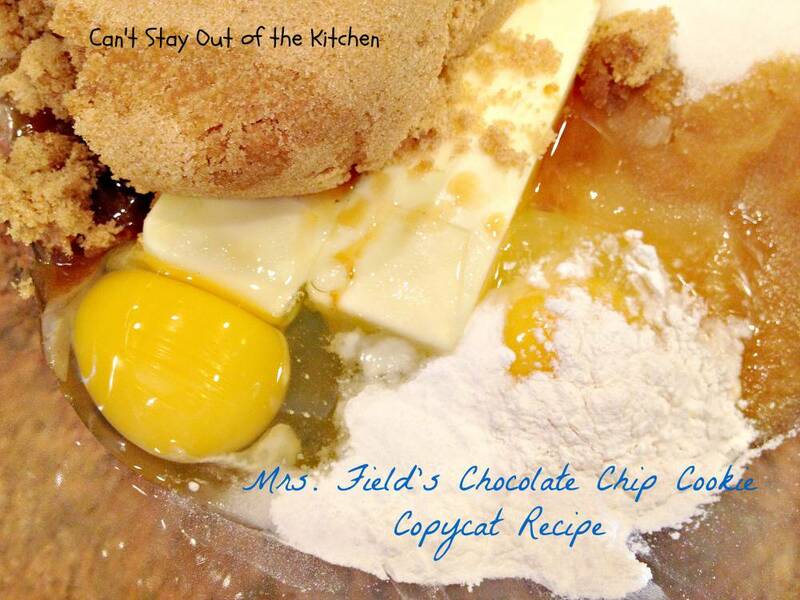 I LOVED, LOVED, LOVED this soft and chewy melt-in-your-mouth copycat version of Mrs. Field’s delicious Chocolate Chip cookies. 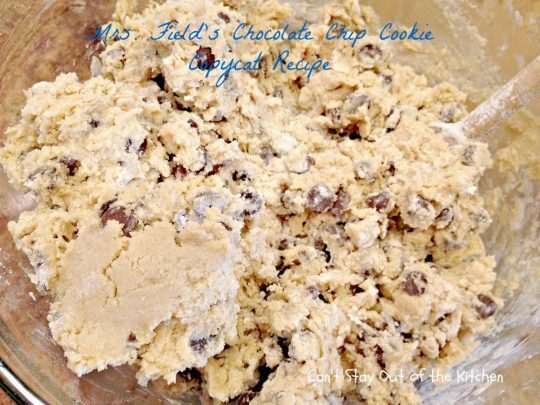 It’s loaded with 50% more chocolate chips than most Chocolate Chip Cookie recipes–and you have only about two-thirds of the volume of most recipes. So that’s a LOT of chocolate! One of the secret’s to making this recipe is the baking time. The author suggested to bake these cookies only 9 minutes no matter what they looked like because they would continue cooking in the pan. Against my better judgment (I normally would have cooked these 1-2 minutes more) I went ahead and cooked them only 9 minutes and allowed them to sink into the middle so they are soft, chewy and doughy inside (just like Mrs. Field’s cookies). If you just can’t stand cookies with this soft of a texture then, by all means, add an extra minute or two onto the time. I probably should have done this so that the cookies would have been a little crunchier and have a little more body, rather than being as soft-textured as these turned out to be. Other keys are to use REAL vanilla–no imitation stuff, and REAL butter–not margarine. If you want a quality cookie, you have to use quality ingredients. You will never be able to get the exact replication of her cookie since she uses multiple kinds of vanilla grown in countries all over the world, but this is really a great tasting cookie. 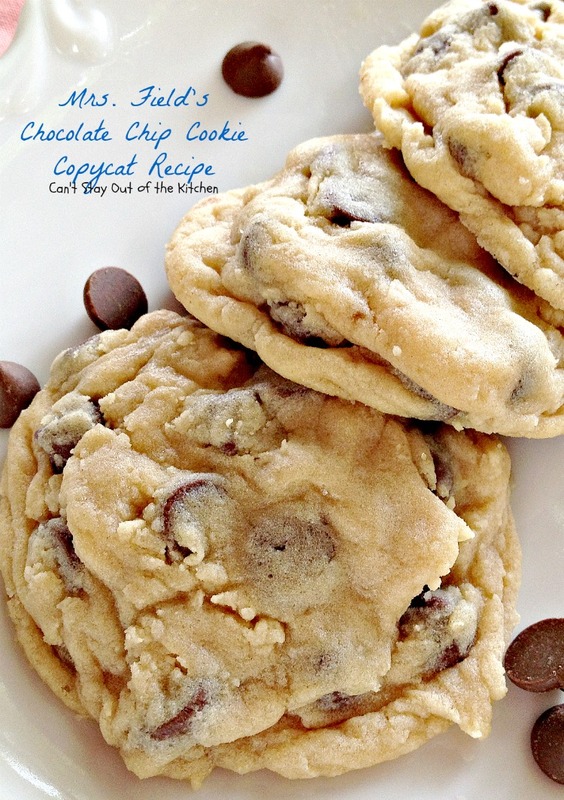 This rich, decadent Chocolate Chip Cookie recipe is to die for! 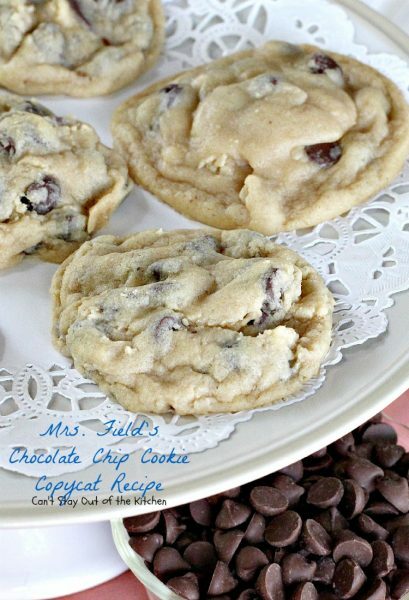 It’s wonderful and I can’t wait to try it in other ways Mrs. Field’s bakes her cookies such as with grated white chocolate, grated dark chocolate, macadamia nuts, almonds or pecans, and even with craisins and oatmeal. 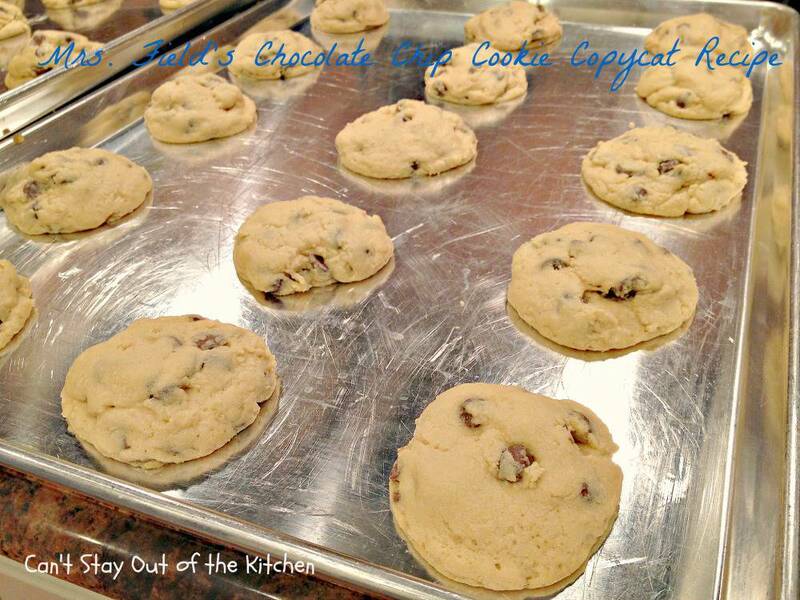 If you’re looking for a superb Chocolate Chip Cookie recipe in time for holiday baking or just because, I recommend you give this recipe a try….and you be the judge of whether or not the cookies should bake 9, 10, or 11 minutes. Or for that matter, cook some at each time interval and then bake them the length you prefer. One word of caution is in order here. These cookies are very fragile because they are so soft due to the short baking time. You will need to handle them with care. Baking them for only 9 minutes is kind of like eating chocolate chip cookie dough. Seriously, 11-13 minutes may be more cookie-like. (I actually prefer baking them about 15 minutes). Even still, hopefully you will enjoy drooling over these cookies whether you cook them 9 or 10 or 11 minutes (or longer), just as I have! 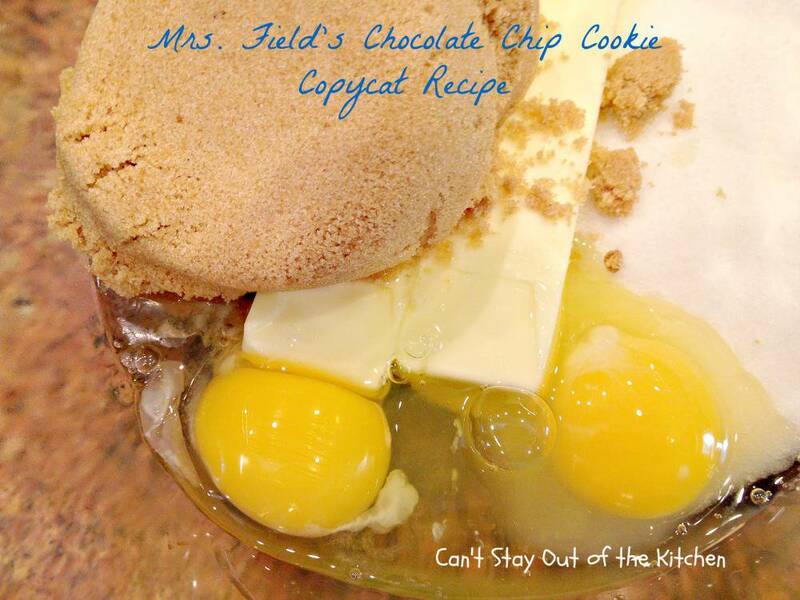 I thought Mrs. Field’s Chocolate Chip Cookie Copycat Recipe was sensational! If you’re looking for a dynamite cookie to WOW your guests, consider making up a batch of these fabulous treats. These scrumptious cookies are crispy around the edges but really gooey and soft on the inside. These cookies are absolutely FILLED with chocolate chips! Mrs. Field’s Chocolate Chip Cookie Copycat Recipe is really an excellent remake recipe by Todd Wilbur. I thought these cookies rocked! 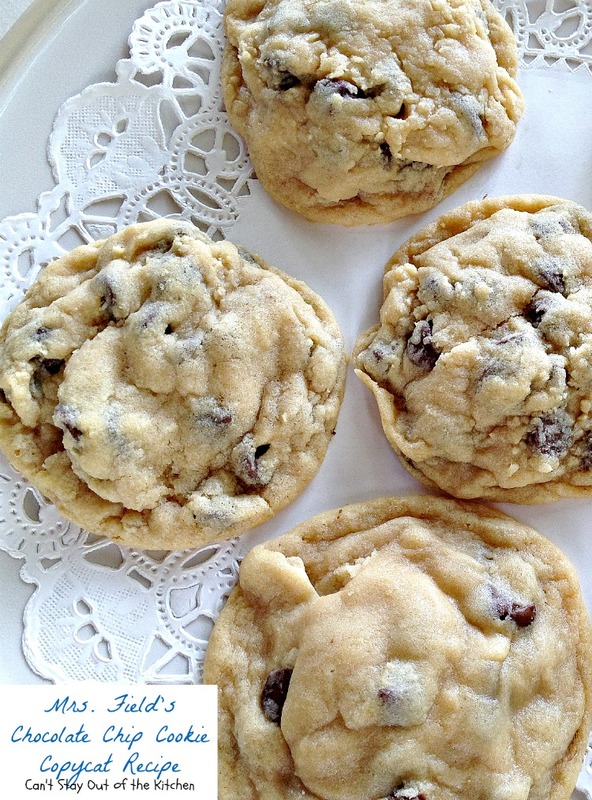 Prepare yourself for sugar high and Chocolate Chip Cookie addiction! Soften butter and place in large mixing bowl. Use REAL butter – not margarine or oil. Add granulated sugar and brown sugar, packed. 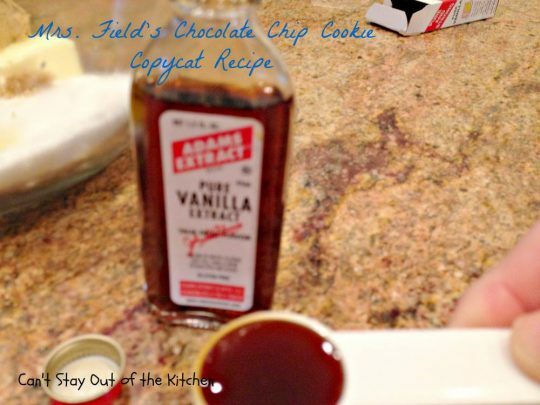 Add REAL vanilla – no cheap imitations or substitutes! Add baking powder, baking soda, and kosher salt. Mix with an electric mixer until smooth. Add UNBLEACHED all-purpose flour. Bleached flour toughens baked goods. Also add 1 1/2 bags of chocolate chips. Roll dough into golf-ball sized balls and place on UNGREASED baking sheets. I was a little leery of putting the cookies on ungreased baking sheets, but the cookies came off the sheets okay and without sticking. Bake exactly 9 minutes at 350 accord to Todd Wilbur. Make sure you have your oven calibrated correctly. This is what the cookies looked like after 9 minutes. They DO NOT look done. The cookies will continue puffing up due to the hot cookie sheet and all the sugar in the recipe. Then they will sink as the cookies cool leaving a crispy outer edge but a soft, gooey texture inside. Quite frankly, I thought these tasted more like eating chocolate chip cookie dough. I think another 1-2 minutes would have been a little more cookie-like. You can see from this close up that the cookies are not done. I would normally have cooked these about 1-2 minutes longer, but took them out due to Wilbur’s instructions. 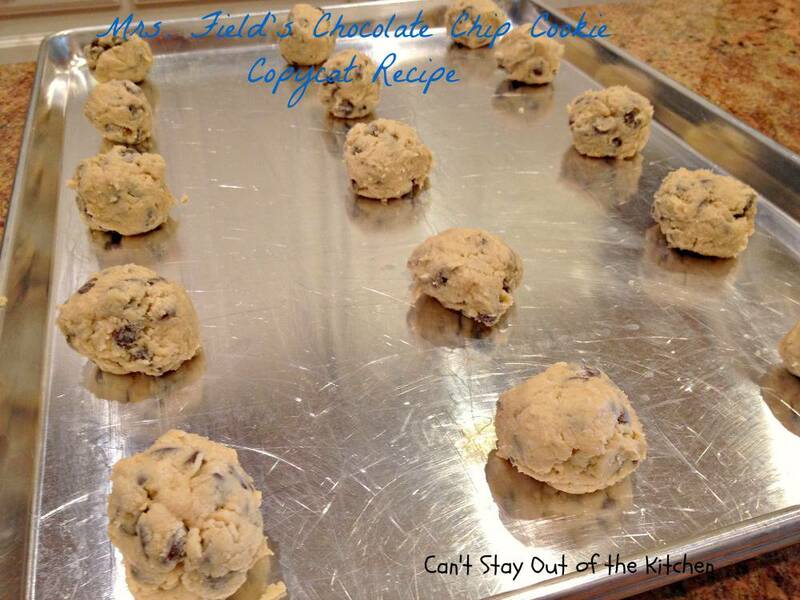 Allow cookies to cool completely before removing from cookie sheets. If you choose to cook these cookies only 9 minutes, don’t overhandle them or they will fall apart because they are so soft. Don’t transfer to a cooling rack. Just let the cookies cool in the pans until you’re ready to place them in the cookie jar or on trays. 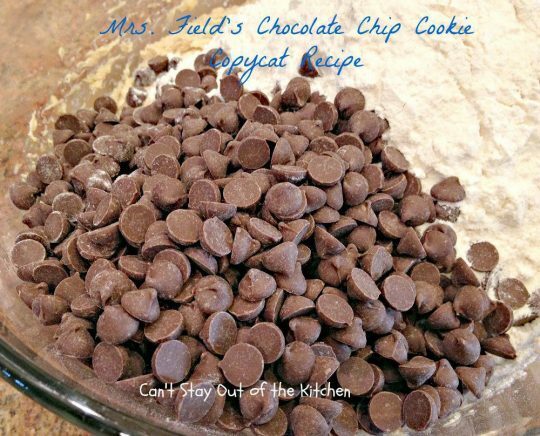 Mrs. Field’s Chocolate Chip Cookie Copycat Recipe is a sinfully rich, decadent, spectacular cookie with crisp outer edges and a doughy, gooey inside filled with lots and lots of chocolate. You will be amazed at how wonderful these cookies taste. If you are concerned about the time element in baking these cookies, place one dough ball on an ungreased cookie sheet and bake it for 9 minutes. Remove and sample the cookie (after allowing it to cool for a few minutes). If you need your cookies baked longer, then cook them for 10-12 minutes instead of 9. Fabulous copycat recipe for Mrs. Field's Chocolate Chip Cookies. Use only the BEST ingredients. Bake 9 minutes--no longer! Uses 1 1/2 bags chocolate chips. In a large mixing bowl, mix the butter, sugars, eggs, vanilla, salt, baking powder and baking soda with an electric mixer until smooth. Stir in flour and chocolate chips with a wooden spoon to combine. Shape dough with hands into golf ball-sized dough balls and place a couple inches apart on ungreased cookie sheets. Bake for exactly 9 minutes or until edges are light brown. (Or consider adding an extra minute or two if you want a more solid cookie). I rotated racks after 4 minutes. NOTE: Wilbur notes that it’s extremely important not to exceed the cooking time even though the cookies appear to be unbaked as they will continue cooking in the pans during the cooling process. If you bake any longer the cookies will not be soft in the middle and crunchy around the edges, which is what the finished product should look like. However, these end up tasting almost like eating chocolate chip cookie dough if only cooking for 9 minutes. You should be the one to determine if another minute or two is something you’re more comfortable eating. Rather than only baking these cookies for 9 minutes, I personally prefer these cookies after baking for 13-15 minutes. NOTE: I highly recommend baking these cookies an additional few minutes if they really look doughy in appearance after 9 minutes, especially since all ovens cook differently. NOTE: You may find the cookies turn out a little better by chilling the dough balls one hour before baking so the cookies retain their shape a little better. NOTE: I prefer making these cookies with 3 1/2 cups flour as they seem to set up a little better. 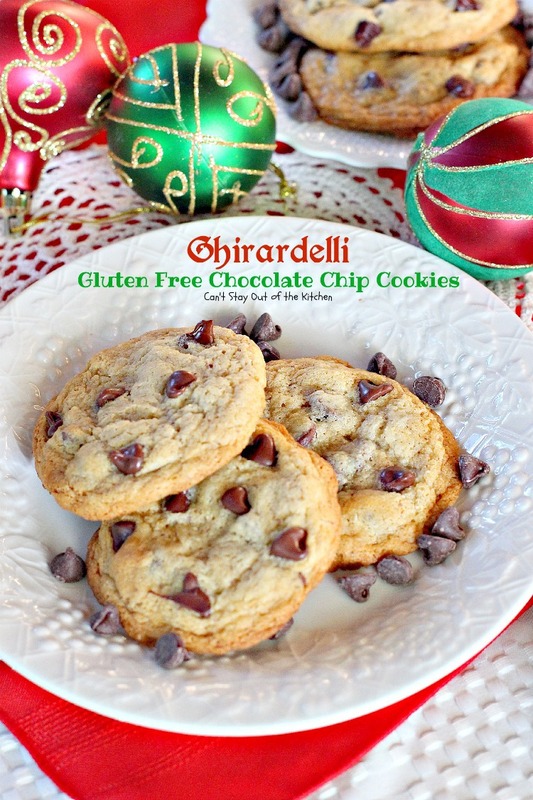 Suggested variations: add 1 ½ cups chopped walnuts, almonds or macadamia nuts to the dough; substitute milk chocolate chips or white chocolate chips for the semi sweet chocolate chips; substitute chocolate chunks or grated Ghirardelli white or dark chocolate for the chocolate chips in the recipe. Recipe adapted from Todd Wilbur's A Treasury of Top-Secret Recipes. 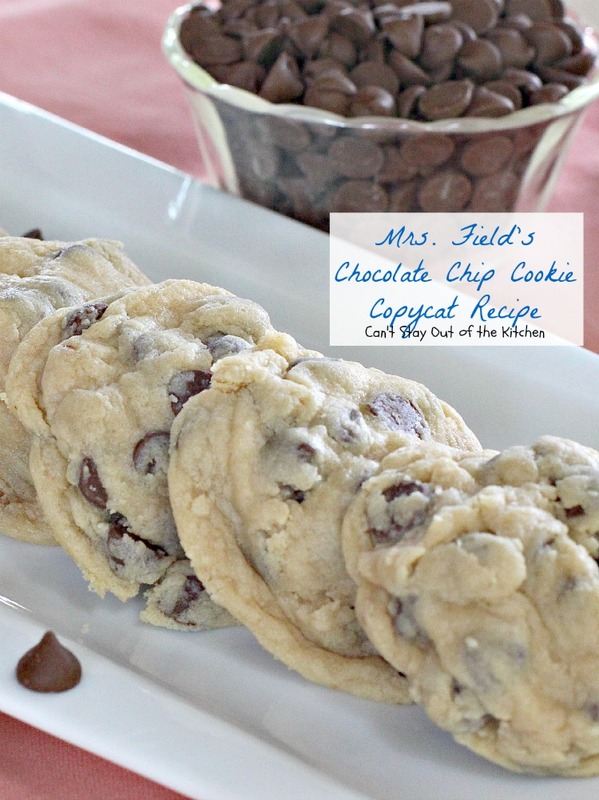 Fabulous copycat recipe for Mrs. Field’s Chocolate Chip Cookies. Use only the BEST ingredients. Bake 9 minutes–no longer! Uses 1 1/2 bags chocolate chips. Wilbur notes that it’s extremely important not to exceed the cooking time even though the cookies appear to be unbaked as they will continue cooking in the pans during the cooling process. 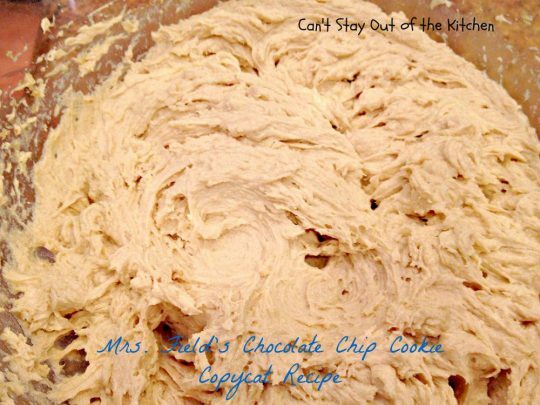 If you bake any longer the cookies will not be soft in the middle and crunchy around the edges, which is what the finished product should look like. However, these end up tasting almost like eating chocolate chip cookie dough. You should be the one to determine if another minute or two is something you’re more comfortable eating. [br][br]I highly recommend baking these cookies an additional few minutes if they really look doughy in appearance after 9 minutes, especially since all ovens cook differently. [br][br][b]Suggested variations[/b]: add 1 ½ cups chopped walnuts, almonds or macadamia nuts to the dough; substitute milk chocolate chips or white chocolate chips for the semi sweet chocolate chips; substitute chocolate chunks or grated Ghirardelli white or dark chocolate for the chocolate chips in the recipe. Your kids will be begging you to make Mrs. Field’s Chocolate Chip Cookie Copycat Recipe often! Come on over and join me for a plate of these tasty jewels! If you love chocolate chip cookies you will LOVE this recipe! Are you salivating yet? Todd Wilbur hit it quite well on Mrs. Field’s Chocolate Chip Cookie Copycat Recipe. Better grab one quickly before they’re all gone! I just baked these tonight and they were a total hit. I used 3 cups of flour, let the dough chill for an hour and used parchment paper lined sheets. I also let them bake for 10-11 minutes. Perfect texture, will definitely be baking these again. Thanks for posting! You say to use 1 1/2 bags of semi sweet chocolate chips. What size bag. There are two to three different sizes. Thanks. Hi Barb. I use 12-oz. bags. So one full 12-oz. bag and 6-oz. of the other bag. Just baked these and I must say that they are delicious. I used 3 cups of flour (scooped out of the flour bag and leveled off) and the dough was the perfect consistency. I also made sure that my butter was not too soft before mixing. The first batch was baked at a little less than 350 (my oven gets hot) for exactly 9 minutes- this resulted in much flatter and softer cookies— very doughy. I kept the second batch in for about 11/12 minutes, i’m not sure —I was just eyeballing for the color I liked. They rose higher, were more firm and had a beautiful golden brown color at the edges– they looked just like the cookies at the mall! The second batch was crispy at the edges, chewy and dense in the middle. Hi, Stephanie. So glad you worked with the cookies to obtain just the right texture! I know these are a little high maintenance, but so worth it. Glad you enjoyed them. I love the taste of these cookies but I did add the extra cup of flour and am not happy with that. They are to thick for our liking. Will try again with only 2 1/2 cups of flour. Hi Roni. You may have to cook them a little longer than the original 9 minutes. Every oven cooks differently. Hey Teresa. 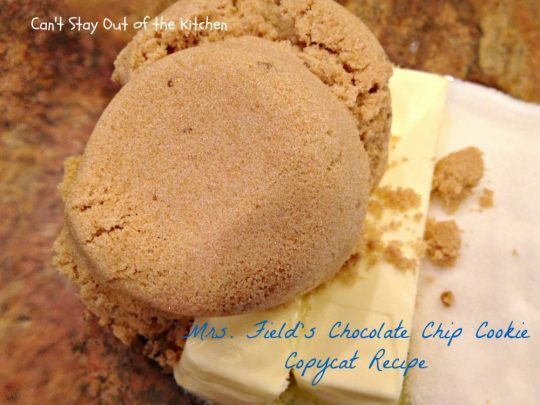 I’ve made this recipe in the past and remember them tasting just like Mrs. Fields. Loved them. Back then I wasn’t much of a baker and just scooped my flour right out of the bag. I tried them again this time weighing out all the ingredients, but they turned out super flat. What do you think gives? Should I add some flour? Hi, Ryan. You have two options. You can chill/freeze the dough for 15 minutes and they should hold their shape that way. I personally like the addition of a little flour. I find this recipe works best with 3 to 3 1/2 cups flour even though the original “copycat” recipe only calls for 2 1/2 cups flour. Perhaps that will help. Can the cookie dough be frozen in small batches so I can bake them when I crave warm cookies. Thank you! Hi, Ruby. You can do that. I freeze the baked cookies all the time, then just pull them out and microwave one or two when I want them later. Either way will work. Enjoy! Great recipe, I didn’t chill the dough and they spread quite nicely. I like my cookies flat not puffy. They came out chewy and melty with tons of chocolate chips. The only thing I might try is baking at 325 versus 350. My oven runs on the hot side, as my cookies were a little brown on the edges. I don’t do the raw cough dough “look”. Definitely going to make these often. Thanks Yvonne, I’m so glad they turned out well for you. It’s really a great recipe. If you add one cup of oat flour ( grin oats raw in blender till it goed to flour. About two minutes. ) Add this to the other ingredients. Then add an eight oz chocolate bar to the mix. Brpken up. Chef Walt. Been making them this way for years. Hi, Chef Walt. It sounds delicious this way! Thanks for sharing. Have a great weekend. Ours somehow did not have any type of thickness to it. It started runny, finished runny. No way rolling a ball was possible with these. We have thick runny goo. Miranda, I would add a cup of flour or so to your cookie dough. That will always solve the problem of runny cookies. Unbleached flour is a little thicker then regular all purpose flour, so I don’t usually have that problem. Followed everything to a T. I personally liked the texture and taste, the wife said it’s a tad too sweet and the inside looked oily and uncooked. I’ll see what our daughter says about it, but I’ll try doing another tiny batch, this time with the dough chilled for an hour. I usually chill my cookie dough for at least 24 hours, 36 at the most. Hi there. You may also want to bake them a few more minutes if you think they’re undercooked. Chilling the dough may also help. Hope you enjoy them. 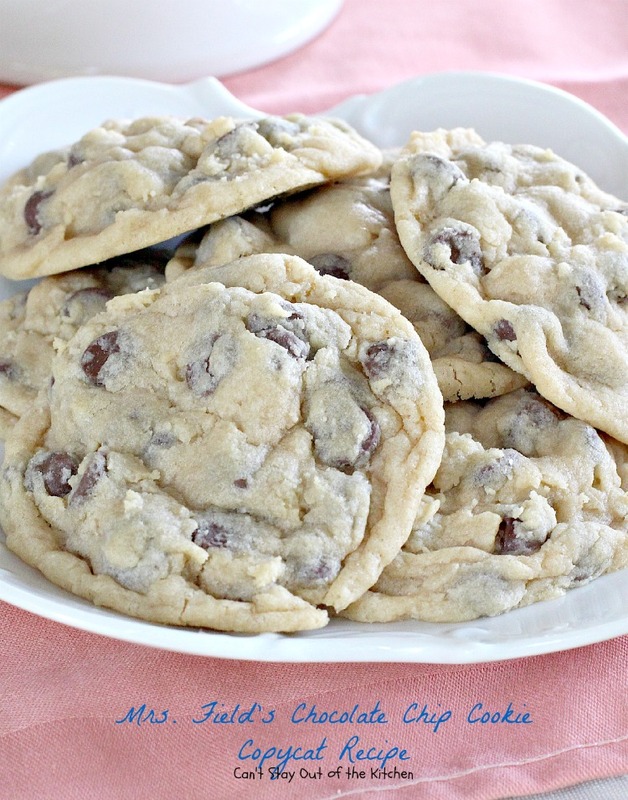 These are the best chocolate chip cookies I have ever baked and I have baked for many years! I did put them in the refrigerator for awhile before baking. Thanks for a great recipe! Thanks, Debby. We loved the taste too. I thought the cookies were a little “delicate” when baking for only 9 minutes. Each oven is different. I actually prefer baking these cookies about 11 minutes so they are a little crispier. At nine minutes on some ovens they may taste more like eating cookie dough! Anyway, I’m glad you enjoyed them. I’ll make notations on the recipe card. I also baked them for about 11 to 12 minutes. I do have to bake everything in my oven a little longer than the recipe instructions, even though I check my oven temperature. Yeah, my cookies almost always take longer (sometimes 10 minutes longer!) than a lot of recipes. I just eye ball them and take them out when they’re done. I can’t even explain how bad my first batch came out….. putting the batter in the fridge to chill for a bit…. Let’s see what happens then. I’ve made this several times, Tamika and never had any problem. But chilling the dough will almost always help cookies turn out well. I tried this recipe today and I must say it was a big hit with the family. I am going to try it with white chocolate and macadamia nuts next. I’ll let you know how it goes thank you. So glad you enjoyed the recipe. 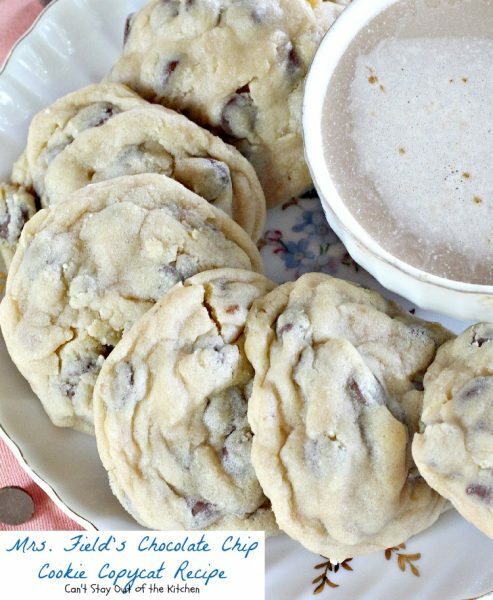 I have a Mrs. Field’s white chocolate chip cookie recipe too. Hope you give it a try as well. I was so excited to try these cookies but mine turned out flat as pancakes! Not very good. I did everything as instructed. I think they should maybe be chilled before baking? That may be a good idea, Meghann, you can also increase the flour by about a half cup (especially if you use regular flour instead of unbleached flour). You may also need to cook them just a little bit longer. I discovered this Todd Wilbur recipe around 2000 or so. It is amazing. One strange thing though that I have always found, it works very different in various ovens. When I make it in a convection oven they are insanely amazing and taste identical to Mrs. Fields. But when I make them in a conventional oven they are quite different. Still good but not nearly as crazy amazing. I can’t figure it out. I currently don’t have a convection oven so I don’t make them often cuz they just don’t taste as good as I know they can. I move a lot. I’ve used 3 convection ovens and 10 or more conventional, and they never taste as good! Strange! I’m sure the ovens make a good deal of difference, Tara. I had double ovens when I made this initially. The top oven (which I used most of the time) was always slower than the bottom oven to cook anything (even though it was calibrated to 350). We are in a rental house now while our new home is being built. The oven is circa 1980s and it is very hot. I have to be really careful with overbaking stuff. One of the keys to this recipe is not overbaking it. 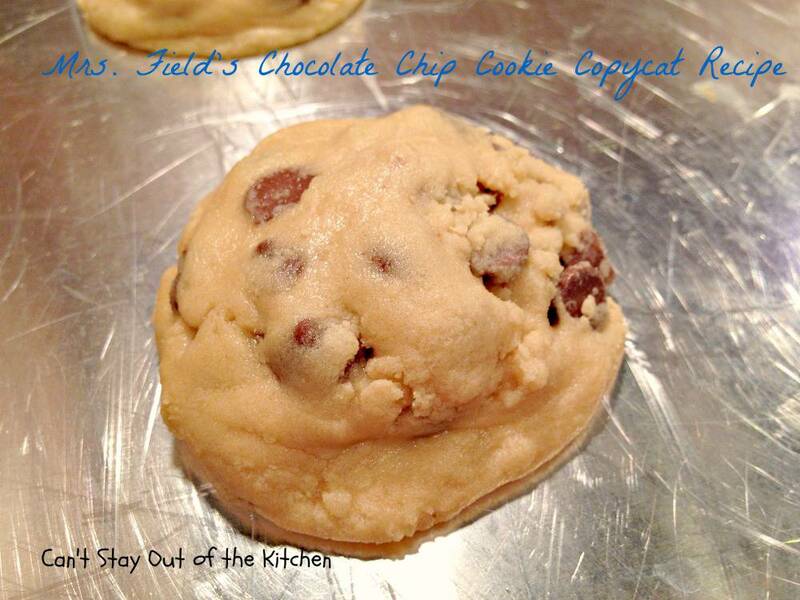 Once we move in to our new house in a month or so I’ll have to give this cookie a try with a convection oven. Thanks for the tip. just made these. I only used 2 cups of chips. I did not think it needed that much chocolate chips. I added a Tablespoon of milk in the middle of adding the flour. Please measure our your flour after you sift it (my personal rule). Also, I froze them for 10 min before baking so that they don’t flatten out so much. Hi Kelly, I’m glad they turned out well for you. It is a delicate recipe. When I bake this recipe I have to bake it almost 12-15 minutes because my oven runs slow otherwise they are still like cookie dough! Thanks for letting me know. The extra chocolate chips really do make the recipe a lot sweeter and more chocolatey. Prepare yourself for some really yummy cookies! Oh, these look soooo good! Chocolate chip cookies are one of my favorite things in the whole world. Your pictures are gorgeous. I am going to make this recipe soon! These cookies were outrageously good even though underbaked!